Parents, students and community members filled Meridian Creek Middle School's commons Saturday morning to give input to the West Linn-Wilsonville School District Long Range Planning Committee (LRPC) on the capital improvement projects that could end up on a potential bond measure in the November 2019 municipal elections. Over the past several months, the LRPC, which consists of seven appointed community members and a school board liaison, has worked closely with the district, the cities of West Linn and Wilsonville, Clackamas County, developers, demographic companies and financial advisors to assess the district's long-term needs and develop projects that address the most pressing ones. "We studied the 10-year growth enrollment projection, showing steady growth across the district," LRPC member Kim Jordan said. "We re-examined the capacity for all of our existing buildings." The LRPC also considered the year-long high school study conducted by WL-WV Superintendent Kathy Ludwig to "learn current and progressive models for teaching and learning in the high school setting," Jordan said. Feedback from the broader community at forums and through surveys was also considered while the LRPC developed the capital projects. Saturday's summit was another opportunity for the community to share its opinions before the school board decides whether to go out for a capital bond, and which projects to include in the potential measure. The seven projects the LRPC presented at the summit would cost an estimated $206.8 million. The projects listed on the Capital Improvement Plan (CIP) include updates to make all schools more safe and welcoming, a new auditorium at Wilsonville High School, improvements and expansion to parking and the stadium at West Linn High School, a new primary school in Wilsonville, district-wide technology updates, moving Arts and Technology High School to the current site of Athey Creek Middle School and retrofitting the building as a high school, rebuilding Athey Creek on the district's Dollar Street property and several other district-wide improvements. Students, parents and community members expressed strong interest in each of these projects. WHS junior Mikaela Ochocki, stressed the importance of a new auditorium at her school. Ochocki, who is an officer in the drama club, said that all of Wildcat Drama's productions sell out and parents have to stand crammed together for choir performances in the auditorium. Several parents emphasized the importance of safe schools and up-to-date technology, saying those things should be a given, not a consideration. Others wanted to ensure that the projects would improve schools for all children, including students with disabilities. 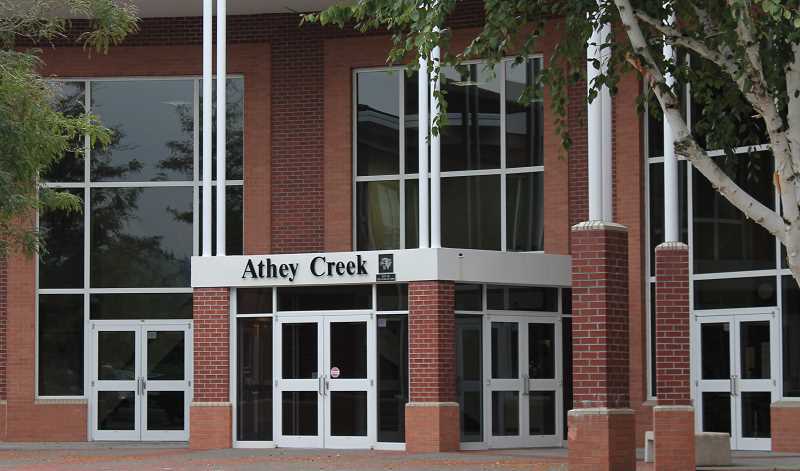 According to the results of the summit's polling activity, the project community members find most important is the relocation of Athey Creek and renovation of the current building for Art Tech. A larger Art Tech, which according to the plan would have about 500 students, will be critical for the district in coming years. All three high schools are already near maximum capacity and, according to enrollment projections, will far surpass those limits in the next 10 years. The next most important project based on the activity was the new WHS auditorium. This project would create not just a new 600-seat auditorium and space for drama instruction and stage craft, but transform the current theater space into classroom space, specifically for career and technical education and to allow for more parking. Though the board does not have to include all seven projects on a potential bond measure, to do so would not raise taxes above the $3 per $1,000 threshold that West Linn and Wilsonville residents currently pay. "You've paid off a loan and you now have the capacity to renew another loan. That's the position we're in today," Ludwig said. "One of our large bonds is being paid off and we now have capacity to stay under that $3 mark and go out for another loan." District staff will now create a report of the community's feedback from the summit for the school board to review. If necessary, the board will ask for more community input on potential bond projects before its final decision on the bond in June.